With only days left to go until the Army Corps of Engineers makes a decision on whether they will allow the potentially devastating Dakota Access Pipeline to cross under the Missouri River a few feet north of the Standing Rock Reservation, the Tribe’s efforts to stop the pipeline in a campaign called #RezpectOurWater are gaining serious traction. This weekend, three stars from the upcoming Justice League film—Jason Momoa, Ezra Miller and Ray Fisher—have published messages in support of Standing Rock and in protest of the pipeline on social media channels. Momoa was the first to jump on board with the #RezpectOurWater campaign through a post on his personal Instagram account, @prideofgypsies. 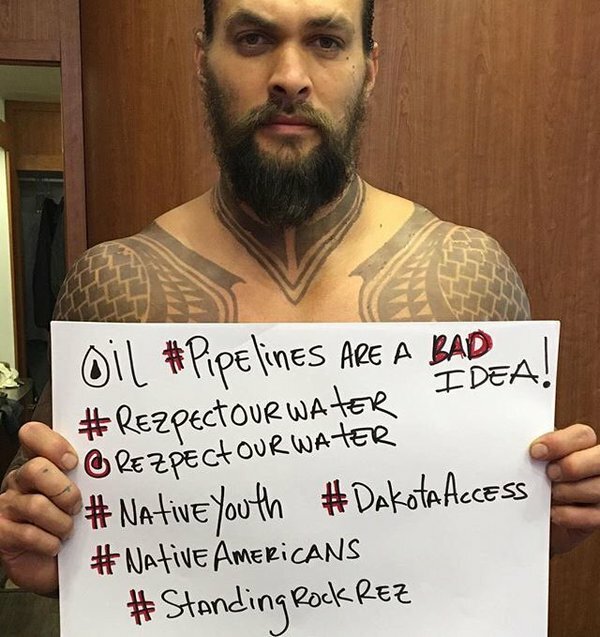 In the photo, Momoa holds a sign that states, “Oil Pipelines Are a Bad Idea.” The sign includes a list of relevant hashtags from the Tribe’s social media campaign. Shortly after Momoa posted his photo, Miller and Fisher shared the same message via a video published on the Change.org YouTube channel. In their video, they urge fans and supporters to sign the petition to prevent the pipeline from crossing under Standing Rock’s primary water source, the Missouri River. “We want to say that our hearts are with the Native youth of the Standing Rock Reservation, and that we oppose the Dakota Access Pipeline,” Miller said in the video, which was shot on the Justice League film set. Organizers, officials and youth from the Standing Rock Sioux Tribe hope to encourage many more public figures and influential people to join their fight against the pipeline through statements of support and signing the petition, as a pipeline break would surely devastate the environment, health and well-being of the land and people of the Great Sioux Nation. As of Monday afternoon May 9, more than 38,174 people had signed the petition on Change.org, about 11,000 shy of the stated goal of 50,000 signatures. Responses to "Justice League Stars Protest Dakota Access Pipeline, Support Standing Rock Sioux"
Humanity please stop destroying our wonderful world! It's our Mother, our Life giver! Start respecting Her and all of her Children!